56 by 51 cm., 22 by 20 in. This beautiful early painting by Simeon Solomon has not been exhibited or recorded since the time of the Royal Academy Winter Exhibition of 1906, the year after the artist's death. It is a highly important rediscovery from the fascinating period in English art when the new and progressive Aesthetic style of painting emerged, in which movement Simeon Solomon was a vital figure. Among the circle of critics who understood the innovations that Solomon's painting represented A Young Musician was seen as a great achievement and a point of arrival in the young artist's career. The Athenaeum believed that 'Mr Simeon Solomon [was] rapidly developing into a fine artist, coming out of the extravagancies and exuberant freaks of execution he at one time indulged in' but that this was undoubtedly 'a work remarkable for sweetness of expression and solid execution.' The Times concluded: 'This is a very impressive and noble figure, not marred by the ugliness in which Mr Solomon has sometimes appeared to revel.' The painting was bought at the Royal Academy, or perhaps had already been acquired, by the Leeds stockbroker and collector of Pre-Raphaelite paintings Thomas Edward Plint. Plint died shortly afterwards, and the painting appeared at auction in 1862 where it was bought by the picture dealer Ernest Gambart. The motif of a figure playing an archaic and richly decorated harp seems to have been first explored by Solomon in an elaborate pen drawing entitled ''Babylon hath been a golden cup'' (Birmingham City Art Gallery), made and exhibited in the autumn of 1859. The following summer a multi-figured ink drawing (ex Lord Houghton collection) included the figure of a musician in profile with his head bowed and with his harp resting against his cheek. The pose was elaborated in a further drawing which has all the essential elements of the composition of the present painting (although the treatment of the background is different). 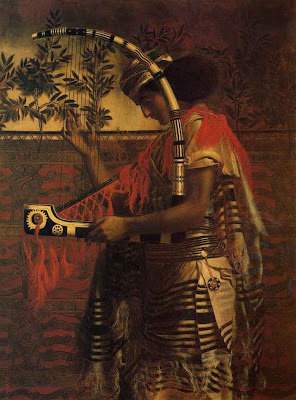 This drawing, entitled A Jewish Musician in the Temple (Huntingdon Library, California), was made by way of preparation for an illustration for the illustrated Bible that the Dalziel brothers were then contemplating (and was in fact included as a plate with the title Hosannah in the book as it was eventually published in 1881 (illd The Brothers Dalziel -A Record of Work - 1840-1890, London, 1901, p.259)). The present painting corresponds closely to the final engraved image. And cheap at the price for that quality.